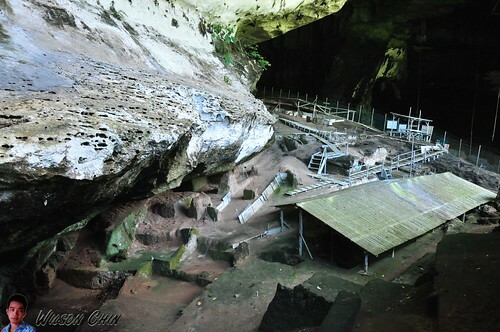 I visited the Niah Cave last weekend with my family and friends. That morning, I wakeup at around 6am. Our initial plan was to wakeup at 5am, and starts our journey at 6am…. Both of my younger brother Kerry and Jye came back home at around 2am last night, so I don’t expect they will wake up on time. 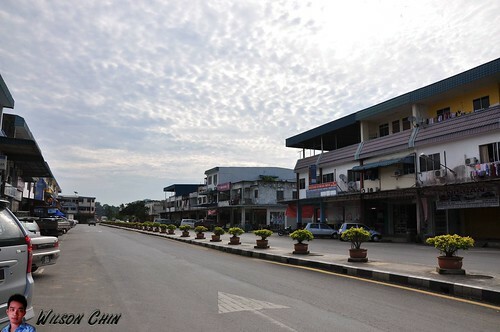 We started our journey at around 7am; it takes about 1 hour and 20 minutes from Miri to the small town of Niah, and we had our breakfast there. 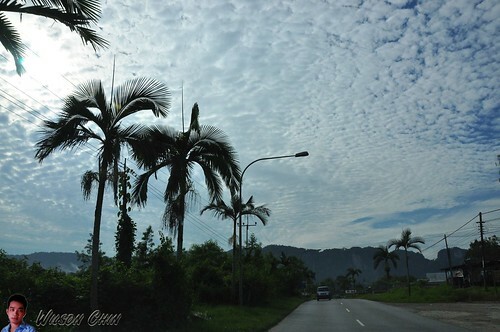 Upon entering Niah town, a nice view awaits us, as I can see the Limestone Mountains surrounding the Niah town. There are only 3 – 4 rows of shophouses. My brothers are familiar with this place, so we had our breakfast at one of the coffee shop there. Most of the Chinese people here they speak Hakka dialect. I ordered my favorite food, the koko noodles, taste really nice :) however, the pricing here are a bit expensive compare to Miri town. My brother told me this is because all the food here needs to pay extra transportation charges. After breakfast, off we go to the Niah National Park. 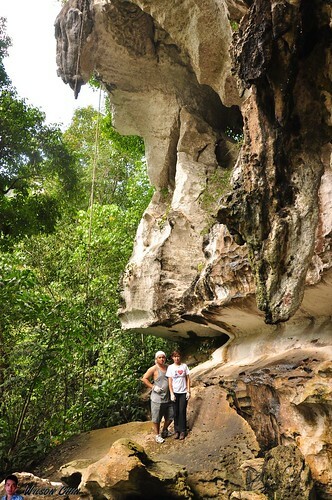 The park is one of Sarawak smaller national park, but this park contain evident of early human activities date back for more than 40,000 years ago. 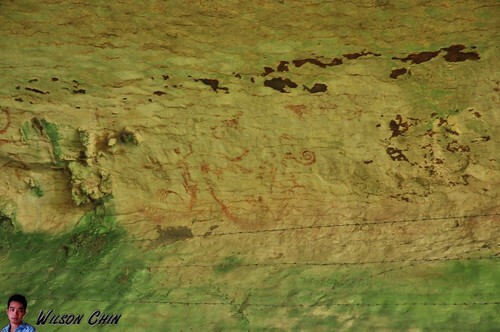 The archaeology found painting on cave wall, wooden coffin which looks like a wooden ship, chopping tools, axes, pottery, and human skull which data at around 38m000 years BCE. 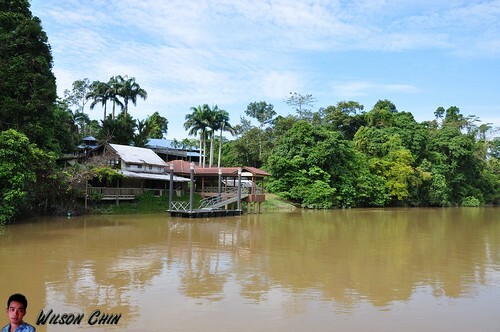 The entrance fees for student is RM5, and adults is RM10, then we also need to use a boat to cross a river which cost RM4 per person. From the starting check point to reach the Great Cave (the end point) is approximately 4 KM from the park office. 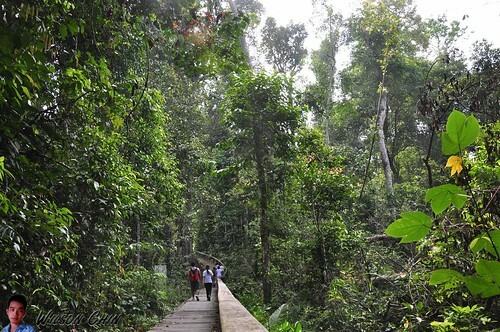 We start our journey at 10am; to reach the cave first is a plank walk which is enclosed on both sides by dense primary rainforest. The trees are so huge that I think it need 10 person holding hands to surround the tree. The forest consists of swap and wetland, I’m pretty sure it might have crocodile there because the water is so calm and a perfect condition for crocs to live. There are several small cave pathways, and the first to reach is the Trader’s Cave, here lies some strange looking rocks formation. 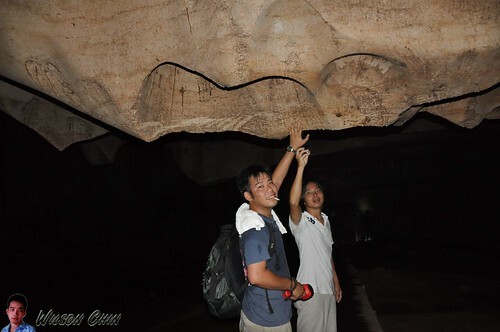 Then a few minutes later, we then reach the Great Cave, according to the record is about 60 meter hight and 250 meter wide, and it is one of the world’s most spectacular cave entrance leading to an even larger chamber within. 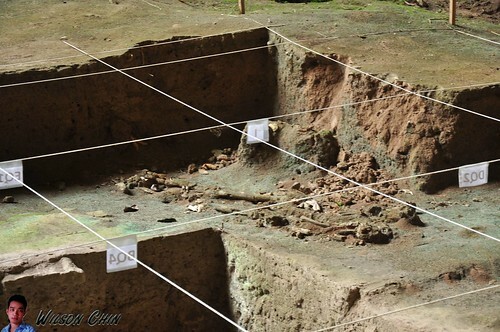 On the entrance, I can see some archaeological excavation. The authorities fence up the place, so I can’t go in to take a clear photo of it. But it amazing to see it live how the site of an archaeology looks like (always seen this in the TV and books only). 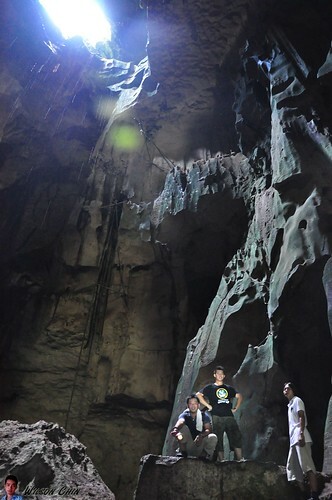 Then, we proceed into the cave and I notice the sound of bats and swiftlets are everywhere. 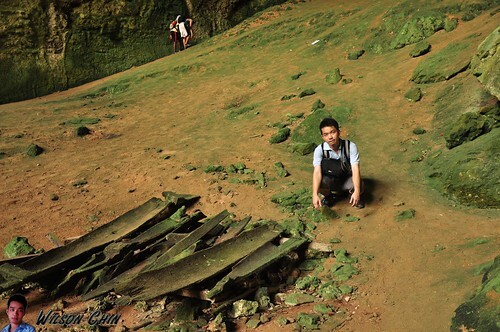 Pheww~~~ lucky I have wear my trekking shoes on, cause a lot of guano (bird and bat excrement) covering all over the cave floor. The locals here, they will collect the guano, pack it and then sell to people who use it as fertilizer. Dad told us that he felt pain on his knee, so we all slow down and rest for a while. We are now inside a larger chamber know as Padang. I watched that movie “Santum”, and there is a scene where the water pouring in due to the heavy rain. The surround atmosphere are the same right now, it gives me the goose bumps. Okok, snap out of it….. Here a shaft of sunlight stream down from the large holes in the cave roof, and the sunlight are so strong that time, it illuminates the bizarre rock formation inside the cave. This is just perfect for me to take a good shoot in the cave. If we’re trap down here, the hole at the cave roof is our only way out, but is like 10 stories height, not easy to climb up there. 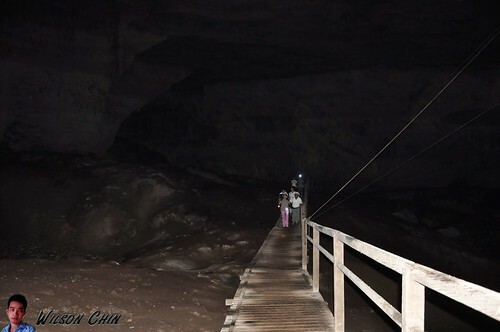 After this chambers, we then enter to another chambers where is start to become pitch black, good that we bring a lot of torch lights, and are able to find our way along the plankwalk. In this chamber we get to see a lot of strange rocks formations, I believe these are all done by the Mother Nature with wind, and water. And after millions and millions of years later it then forms these wonderful shapes. My flash is not strong enough, so all my photos are pith black. Dear dad’s knees are getting worse, but in the same time he’s so exited on exploring the cave, so we keep on encouraging him to forget about the pain. 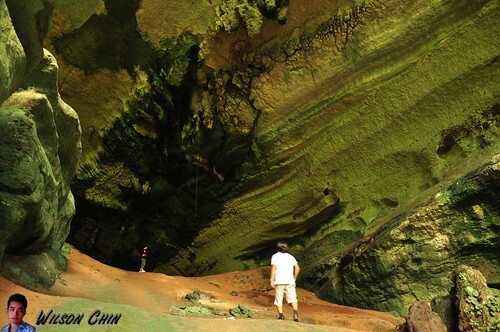 After the pitch black plank walk, we then reach the famous Niah Painted Cave. Again, the paintings are all fence up by the authorities, so I only can take photo from a far distant. I saw some human like cartoon painted on the wall, so the cave man likes art. Not just painting, here they also have this “death-ship”. Where this is the coffin for the cave people, I saw a human skeleton there; this might be the one which date back like 40,000 years ago. Is to fascinating to see in real life how a historical human skeleton looks like. 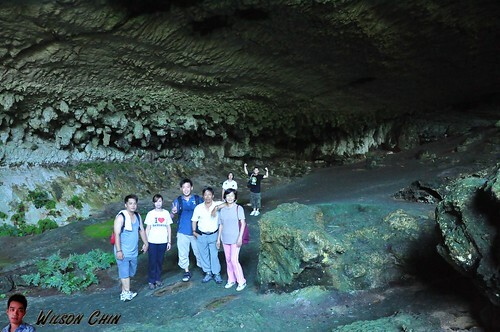 We all took a rest at this cave, and mum bring along some fruits and dumpling that she made, and this is the perfect time to have lunch after all the climbing and walking. On our way back, what we worry most is dad. He told us that his knees are killing him, poor dad. We all walk very slowly, and keep on encouraging dad to fight the pain. 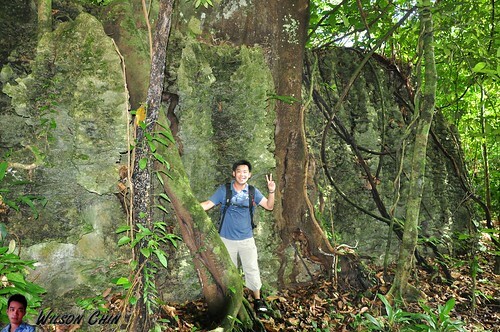 At Niah Cave, the local here also collect birds nest. 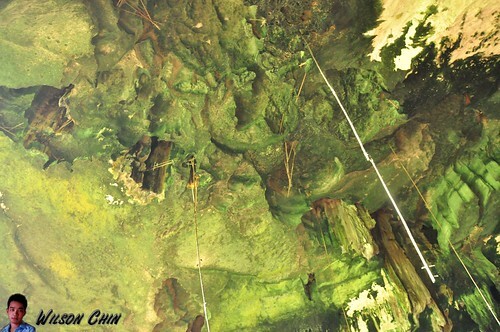 There are bamboo poles and self-made ladders on the chambers of the cave wall, so they only use this bamboo poles to climb to the cave wall and collect the birds nets. This is extremely danger, they don’t have professional climbing gears, all local made. Is pity where human need to do such danger work to put food on the table for his family. We reach the park HD at around 2pm, before that we even visited the museum. Dad didn’t go in, he just sit on the chair outside *tsk tsk* he ask us to go ahead. The boat is waiting for us when we reach the jetty, after crossing the river. I drive the car to the entrance to pick up mum and dad. 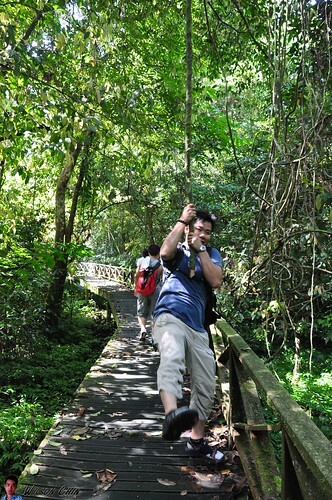 Is a wonderful family trip, again I manage to cover a new place at Sarawak. 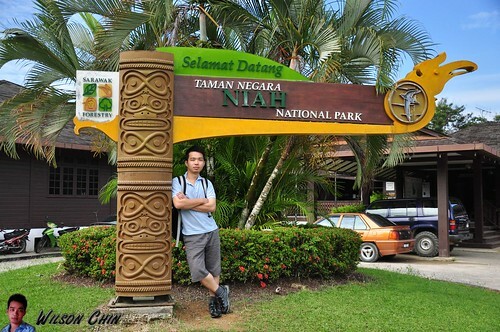 Hope I’m able to visit all the magnificent places at Sarawak in the future. The photo of the sky is simply amazing. Perfect! Thanks, and if you're free we can go take photos together, and I'll share with you some of the skills that I've learn.